Twin gestation is a high-risk pregnancy due to the increased adverse feto-maternal events associated with it. Its incidence has been on the rise over the last 30 years due to increased use of assisted reproductive technologies and delayed childbearing. Twin pregnancy refers to the implantation of two fetuses within the endometrial lining of the uterus. It can either be monozygotic which results from a single fertilized ovum or dizygotic resulting from fertilization of two different ova. Predisposing factors to twin pregnancy include race, diet, heredity (family history of twinning, especially in a first-degree relative on the maternal side), increasing maternal age and parity, maternal height and weight, previous twin deliveries, and pregnancy soon after cessation of long-term oral contraceptive use. Twin pregnancy shows a wide racial variation worldwide. It has been noted to be the lowest in Asia with a frequency of 1.3/1000 births in Japan, while the highest rate of 49/1000 births has been documented in Western Nigeria. Twin gestation contributes significantly to the burden of maternal morbidity, especially in our society where the highest incidence of twin pregnancy has been noted, and this underscores the need to periodically review twin gestation so as to give up to date information to healthcare providers. This study therefore aims to determine the incidence and maternal morbidities associated with twin gestation in the Federal Medical Centre, Umuahia. This was a retrospective, descriptive study carried out in Federal Medical Centre, Umuahia, Abia state, Nigeria, over a 5-year period from January 1, 2009, to December 31, 2013. The data of women with twin gestation were retrieved from patients' case notes in the medical records department. Data obtained included age, parity, ethnic group, booking status, and antenatal, intrapartum, and postpartum complications. Anemia was diagnosed when the hemoglobin concentration was <10 g/dl. The retrospective nature of this work made ethical approval not applicable. Data were analyzed using WinPepi version 11.65 (Brixton Health, London). Statistical significance was calculated using Chi-square test with level of significance set at P < 0.05 at 95% confidence interval. There were 8289 deliveries during the period of study with 264 twin pregnancies. This gave an incidence of 3.2% (32/1000 deliveries). However, only 186 folders had enough information for data analysis. The mean age of the women was 29.5 ± 5 years. The modal age group was 25–29 years which contributed to 35.5% (66), while multiparous women accounted for 40.9% (76) of the patients. 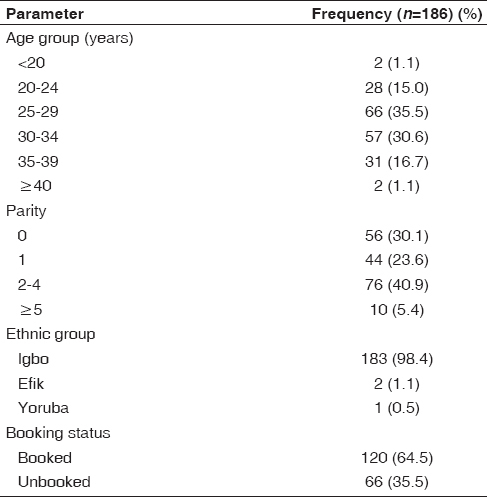 The predominant ethnic group was Igbo which made up 98.4% (183) of the patients. Booked women accounted for 64.5% (120) of the subjects [Table 1]. Preterm delivery accounted for 30.6% (57) of the antenatal complications, while hypertensive disorders of pregnancy were noted in 14.5% (27) as shown in [Table 2]. 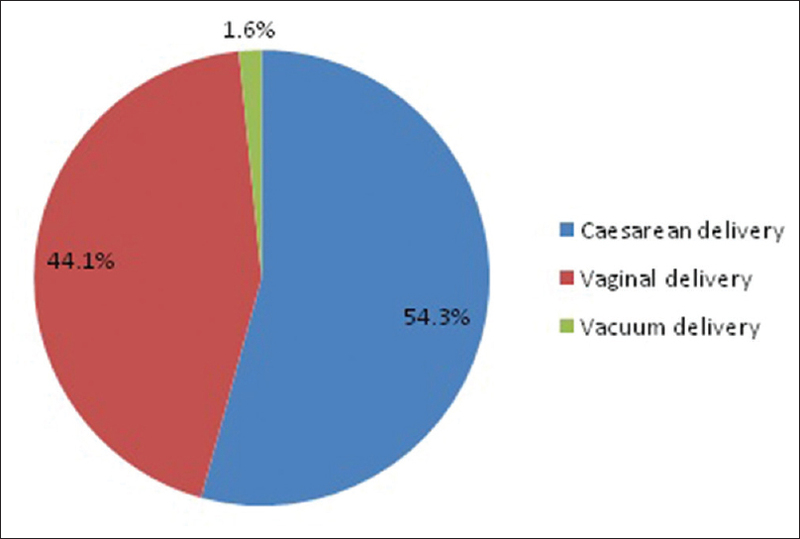 Cesarean section was the mode of delivery in 54.3% (101) of the subjects, however, only 3 (1.6%) had vacuum delivery [Figure 1]. There was no significant difference in the mode of delivery for booked women compared with unbooked (χ2 = 0.13, df = 2, P = 0.94). For those who underwent cesarean delivery, the most common indication was malpresentation of the leading twin which was documented in 40.6% (41) of the women, and this was followed by severe preeclampsia/eclampsia which accounted for 21.7% (22) as depicted in [Figure 2]. Anemia was the most common postpartum complication noted in 25.3% (47) of the patients, while 10.8% (10) had primary postpartum hemorrhage [Table 3]. The incidence of twin gestation obtained in this study was 3.2% (32/1000 deliveries). This was higher than that in the United States and England, as well as that obtained by Attah et al. in Northwestern Nigeria. However, it was similar to that obtained by Okunade et al. in Southwestern Nigeria. This high incidence is in keeping with the fact that the highest incidence of twinning occurs in Nigeria., The mean age of the patients in this study was 29.5 ± 5 years, while most of the women were aged between 25 and 29 years. This was comparable to the studies done by Bassey and Inimgba and Pyrbot and Agarwal. Even though advanced maternal age is associated with twin pregnancy, this group of women is more likely to have completed their family size which may have accounted for their relatively less representation in our study. Multiparous women in this study had the highest frequency of twinning which is similar to what was noted by Singh and Trivedi and Tomar et al. Twinning has been known to be associated with increasing parity which tends to plateau at the seventh birth. Most of the women were booked and this is in agreement with the work by other researchers,, where most of the women studied were booked. Unlike what is obtainable in our subregion, this relatively high rate of antenatal attendance may be explained by the fact that caregivers of women with twin gestation may have appreciated that it is at a higher risk than singleton pregnancy, therefore necessitating the need to seek medical attention. The best method of delivery of twins remains controversial; however, there is an increasing trend towards cesarean section, and in most studies, 50% of the twins are delivered abdominally. Similarly, majority of the patients (54.3%) in this study had cesarean delivery. 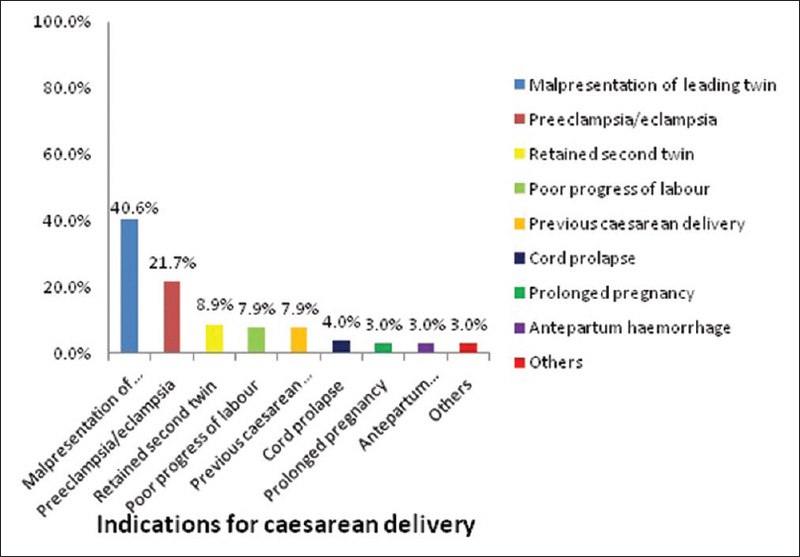 In those who had cesarean delivery, the most common indication was malpresentation of the leading twin which accounted for 40.6% of the cesarean deliveries. These findings were similar to other studies in which malpresentation was the most common indication for cesarean delivery., The indications for cesarean delivery are similar in both the booked and unbooked women in our study as no statistical significant difference was noted between them. The choice of cesarean delivery in malpresentation of the leading twin, especially the breech/vertex combination, may be related to the rare complication of locked twins which has high perinatal morbidity and mortality when vaginal delivery is undertaken. Expediting delivery in the setting of severe hypertensive disorders of pregnancy may further explain the higher rate of cesarean delivery in this group of women. Anemia was the most common postpartum complication documented in the patients, which was similar to the findings by Pyrbot and Agarwal. In addition to profound plasma volume expansion which far exceeds increased red blood cell volume resulting in physiologic anemia, twin gestations generate a great demand for elemental iron, of which sufficient quantity might not be available in many diets, especially in our resource-poor setting. These physiologic mechanisms, together with primary postpartum hemorrhage which was the second most common complication in this study, may further elucidate the high rate of anemia noted in this study. Uterine overdistention, operative interventions, and pharmacologic effects of medications such as magnesium sulfate, which is commonly used in the management of preeclampsia/eclampsia, predispose these women to primary postpartum hemorrhage with subsequent anemia. This study is limited by its hospital-based design which may have omitted uncomplicated twin pregnancies in the community. The study is also limited by its retrospective nature which may have affected data analysis due to inadequate documentation. This study has documented the high incidence of twin pregnancy in our environment. It has also underscored the significant maternal morbidities associated with this obstetric condition. Adequate health education, good antenatal coverage, and early detection of these complications may ameliorate the maternal morbidities associated with this high-risk pregnancy. Aduloju OP, Olofinbiyi B, Olagbuji BN, Ade-Ojo IP, Akintayo A. Obstetric outcome of twin gestations in a tertiary hospital South-Western Nigeria. J Matern Fetal Neonatal Med 2015;28:900-4. AlBasri SF, Shouib GM, Bajouh OS, Nasrat HA, Ahmad E, AlGreisi FM. Maternal and neonatal outcomes in twin and triplet gestations in Western Saudi Arabia. Saudi Med J 2017;38:657-61. Attah RA, Mohammed Z, Gobir M. A review of twin deliveries in Aminu Kano Teaching Hospital, North-West Nigeria. Niger J Basic Clin Sci 2014;11:3-7. Bassey G, Inimgba NM. Fetomaternal outcome of twin gestation in Port Harcourt, South-South, Nigeria. Niger J Med 2014;23:282-7. American College of Obstetricians and Gynecologists, Society for Maternal-Fetal Medicine. ACOG practice bulletin no 144: Multifetal gestations: Twin, triplet, and higher-order multifetal pregnancies. Obstet Gynecol 2014;123:1118-32. Pyrbot JE, Agarwal M. Twin pregnancy-maternal and fetal complications its association with mode of delivery: A study in a tertiary center. Int J Reprod Contracept Obstet Gynecol 2017;6:5089-94. Abramson JH. WINPEPI updated: computer programs for epidemiologists, and their teaching potential. Epidemiol Perspect Innov 2011;8:1. Okunade KS, Daramola E, Adenekan M, Sekumade A, Ajepe A, Osanyin GE. Review of twin deliveries and fetomaternal outcomes in a tertiary hospital in Lagos, Southwest Nigeria. Niger J Gen Pract 2018;16:6-9. Rezavand N, Veisi F, Malek-Khosravi Sh, Zangeneh M, Kohzadi M. Assessment of Frequency of Twin Pregnancy and Neonatal Outcome in Deliveries of Mo'tazedi Hospital, Kermanshah in 2004-2007. J Obstet Gynaecol India 2014;64:19-22. Singh L, Trivedi K. Study of maternal and fetal outcome in twin pregnancy. Int J Reprod Contracept Obstet Gynecol 2017;6:2272-8. Tomar SP, Kushwah SS, Kushwah A. Association of sociodemographic factors with multiple births and birth outcomes in comparison to single births among deliveries conducted at a tertiary hospital in Rewa, Madhya Pradesh. Int J Stud Res 2014;4:8-12. Su RN, Zhu WW, Wei YM, Wang C, Feng H, Lin L, et al. Maternal and neonatal outcomes in multiple pregnancy: A multicentre study in the Beijing population. Chronic Dis Transl Med 2015;1:197-202. Shetty MB, Shivananjaiah C, Swarup A. A retrospective study: Twin gestation at tertiary care, maternal and fetal outcome. Int J Reprod Contracept Obstet Gynecol 2016;5:217-9. Cunningham FG, Leveno KJ, Bloom SL, Spong CY, Dashe JS, Hoffman BL, et al., editors. Multifetal pregnancy. In: Williams Obstetrics. 24th ed. New York: McGraw Hill; 2014. p. 891-924.